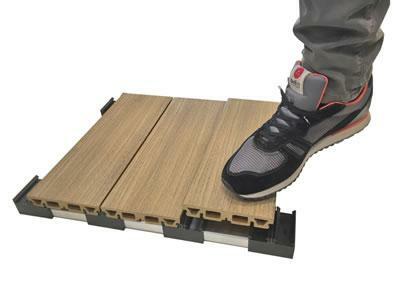 EasyClick is the innovative system which allows you to install iDecking Revolution boards simply using your feet. No need to use any nails, screws, drills, spacers or “obsolete” clips. The EasyClick system helps ensure a quick and simple troublefree installation. EasyClick is essentially comprised of an understructure “rail system” which comes with pre-installed and pre-spaced patented EasyClick nylon clips. Our patented grooved decking boards are then simply pressed and locked in place. The system can be used both for Wood and for Composites such as DURO and ETHERNO (Carbonized Bamboo)!! !